I have finally found the NUMBER ONE foundation for oily skin. 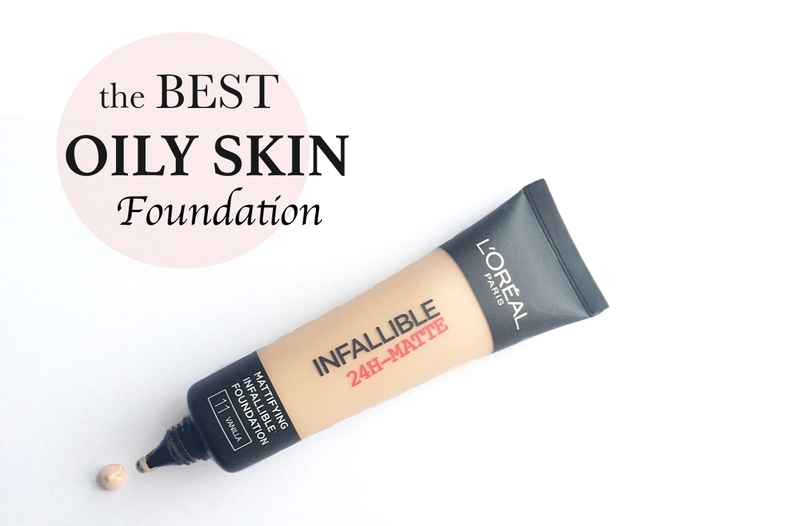 The Loréal Infallible 24Hr-Matte Foundation. It's freaking AMAZING!!! People get your wallets ready and head to the stores! The only similar thing about the two versions is the lasting power. So just keep in mind that I'm talking about the European version. I have tried two different application methods with this foundation. First one was with a brush, it worked pretty well, but since the foundation is a thicker consistency, I recommend using a stiffer brush, like the Real Techniques Expert Face Brush, to get an even application. Next I tried using my fingers, that methods was great, that way I could really work the foundation into my skin and it was fast and easy. Lastly I think applying it with a beauty blender would work wonders, I haven't tried this method myself, but normally beauty blenders work great with thicker foundations. The finish turned out to be exactly the same with the two methods I tried. Super matte, evenly smooth application and high coverage. I would recommend using a hydrating moisturizer right before applying the foundation, especially if you lean more on the normal to oily skin, compared to straight up oily skin. The foundation can be a little drying in the beginning, before your natural oils start kicking in. I get pretty oily during the day, and I feel like the foundation look it's best after my oils have kicked in a bit, because it kinda sets it and makes it look naturally matte, instead of dry like a desert. I haven't tried wearing the foundation for the full 24 hours. But I will say, that it lasts the whole freaking day, from 8 am to 10 pm for sure! Bronzer, blush and highlighter still on. No oils, no nothing. It's looks pretty much the same as it did in the morning. I have never tried that with a foundation before and because of that, I feel kinda addicted to it. Now I won't use any of my other foundation, because this is just too good to be true! The only problem I have with the foundation... is that it broke me out... At least I think it's the foundation, because it's the only thing I changed in my routine. I have kept wearing the foundation everyday since I first used it, and my skin hasn't cleared up yet. But everyones skin is different and it might not have the same reaction on your skin. I will keep using it, in hopes that my skin get's used to it. It's simply too amazing to stop using. Still using this foundation over 1 year later. It was not the cause of my breakouts back then, so back then I'm guessing it was my diet. All in all this foundation is absolutely amazing, no cons. THIS FOUNDATION GETS A 10 OUT OF 10! © 2019 Camilla Rumph. All rights reserved. Powered by Blogger.